We Trufflepiggers have fallen for a new story. It's set on a local farm. Funny how stories are so much closer to home than we often think; our door step delivered milk comes in lovely old retro bottles with pictures of each cow on the bottles, the whole notion seems somehow impossibly outdated. Kate was my fave but when I visited the farm and met Ida, I just knew she was a film star in the making. She was out on Eastbourne beach early in the morning recently, and goodness she really did pull in the crowds (more on this later). Kate and Ida are part of a small herd on nearby Longleys farm which is run by farmer Steve Hook and his dad Phil. It's such an interesting set up. Steve milks the 55 cows. His wife Claire bottles the milk in the kitchen and Phil delivers door to door in Hailsham. It's a great little family business and it's just so ridiculous that dairy farms like this with a fantastic provenance find it so impossible to operate in modern day UK. Steve's herd is about one third the size of what would be expected to be the absolute minimum for an economically viable herd. But he's surviving! What's the USP? Well for one, Steve sells his milk raw, completely unadulterated, its natural goodness intact. However because his milk is unpasteurised, it's unsellable in supermarkets. Is this avoidance of supermarkets how he manages to survive in an impossible market place? Raw milk is really contentious though, it's banned in many countries including Scotland, Germany and the U.S. In the States it's fine to pump cows with bovine hormones to increase milk yield yet the selling of unpasteurised milk is outlawed. Why? 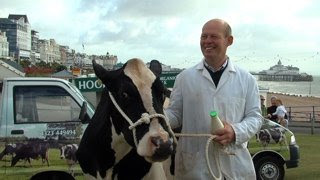 Big business of course, raw milk is very much a small scale, local farm thing which the big dairies hate. Och there's millions to tell and I could go on for ages, and no doubt will. Suffice to say that the farm and what it represents is so interesting that we are now making a new feature length documentary all about it. Watch this space and the website for news and clips coming soon.